On my last visit to NYC my roommate and I decided to try the new place across the street, Xian Famous Foods, on the recommendation of the No Reservations host Anthony Bourdain that their lamb burgers were amazing. I’m not into burgers so much anymore so I chose the only thing on the menu that was all veggie, a cilantro salad. It was refreshing, light and had a little kick to it. My roommate attests that it was a perfect complement to the lamb burger which was pretty damn good if you ask him. If you are like me you grow or buy herbs to use as an accent in a particular dish and then find yourself, a week later guiltily tossing what remains of that big bunch of herbs into the compost. 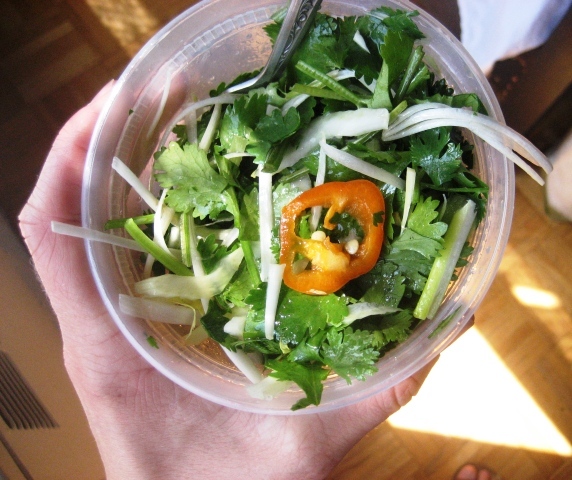 Well, guilty compost no more, try a this herb based salad instead, it’s simple and nutritious and a great way to use up a lot of cilantro at once. Aside from being a good source of fiber, iron, magnesium and phytonutrients, cilantro has been effectively used to help remove heavy metals and other toxic agents from the body. This recipe can easily be doubled and makes 2 side servings. Optional: chili garlic sauce or hot pepper flakes. 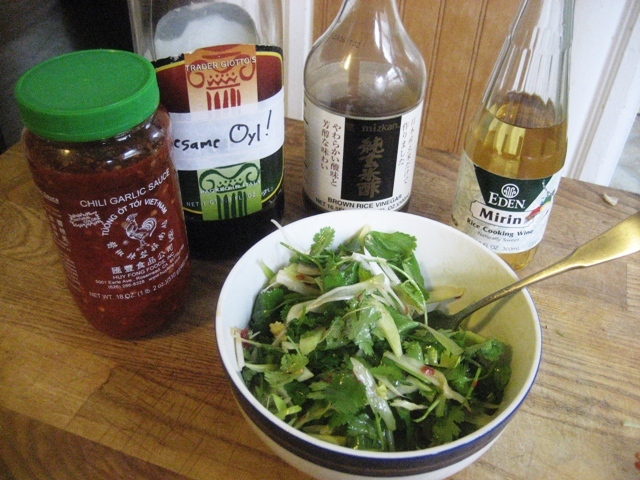 Cilantro salad with dressing ingredients: chili garlic sauce, sesame oil, rice vinegar and mirin. Whisk together the dressing ingredients and adjust the proportions to your liking. Prep all the veggies and add them to your bowl with the dressing.